Leading spray foam insulation manufacturer, Icynene, today introduced new 4 hour re-occupancy allowances for homeowners and trades in the United States for two of its high-performance spray foam innovations. "This is great news for building owners of all kinds. The reduced re-occupancy allowances mean that homeowners no longer need to be displaced for multiple days when having spray foam insulation installed into their homes." Leading spray foam insulation manufacturer, Icynene, today introduced new 4 hour re-occupancy allowances for homeowners and trades in the United States for two of its high-performance spray foam innovations – light-density open cell Icynene Classic Max and medium-density closed cell Icynene ProSeal. 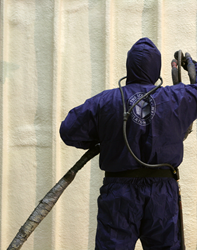 The 4 hour re-occupancy allowance follows many months of detailed research, testing and assessment of the refined Icynene Classic Max and Icynene ProSeal spray foam products based on protocols and procedures developed by the American Chemistry Council – Center for the Polyurethanes Industry (ACC-CPI). “Through full scale testing and research reviewed by third party research chemists and toxicologists, on our low VOC formulations, re-occupancy times for homeowners can be significantly reduced--from 24 hours to four (4) hours. Refinements to our Icynene Classic Max and Icynene ProSeal spray foam, combined with the use of higher workplace ventilation rates of 40 Air Changes per Hour (ACH), have helped us reduce exposure risks to spray foam installers, non-spray foam trades and most especially for the homeowner,” said Icynene VP Engineering, Paul Duffy. “This is great news for building owners of all kinds. The reduced re-occupancy allowances mean that homeowners no longer need to be displaced for multiple days when having spray foam insulation installed into their homes. They are able to re-occupy their home and enjoy the advantages of spray foam insulation almost immediately. Plus, the new re-entry and re-occupancy allowances present builders and general contractors with a tremendous opportunity to incorporate Icynene’s high-performance, low VOC spray foam innovations into their upcoming projects due to the minimal impact on construction schedules.” said Mr. Duffy. The new re-entry and re-occupancy allowances for Icynene Classic Max and Icynene ProSeal are based on an active ventilation rate of 40.0 ACH. For certified spray foam installers, the low VOC Icynene Classic Max and ProSeal formulations also feature low odor properties a cleaner spray application for better sprayability and less clean-up and gun clogging. The new re-entry and re-occupancy allowances are applicable only for installations of Icynene Classic Max and Icynene ProSeal in the United States.